I never knew Aircraft Commander, Don Bee Jensen, as “Doc.” I knew him for most of my thirty-two year airline career as Don, respecting him as a pilot and a very fine guy, one of many fine guys in the industry. During that period he never once mentioned this harrowing incident that took place so many years ago. That alone says a lot about his character. Documented below – when flying skill and a little luck won the day – are the words of the aircraft commander. The true story of a hair-raising event which should have been a tragedy. No one, until this day in 1972, had survived an off airport landing in a C-130 Military Transport. The depiction of the aircraft below was commanded by Don B Jensen my former Chief Pilot at American Airlines. SUBJECT: Aircraft combat loss (Written off). C-130E Hercules, Serial Number DY 63-7775. WHERE: Approximately 25NM south An Lôc, RVN, en route emergency airfield, Lai Khe, RVN. WHEN: Approximately 1130hrs, 18 April 1972. WEATHER: Sky conditions: Clear, visibility unlimited, Winds: Light and variable, temperature: 34deg C.(94deg F.), humidity: >90%. MISSION: Container Delivery System (CDS) airdrop, 30K lbs Class A explosives. Mission briefing early morning 18 April 1972, Base Operations, Detachment One, 834th Air Division, 374th Tactical Airlift Wing, Tan Son Nhut Air Base, RVN. Mission specifics: Resupply CDS airdrop of resupply ammunition to South Vietnamese Marine defenders and United States Army Advisors located An Lôc, Republic of South Vietnam (RVN). Intelligence briefing included expected enemy resistance from three divisions North Vietnamese Army (NVA) and local Viet Cong soldiers. Expected resistance was defined as “expected heavy”. Upon arrival at aircraft, crew was briefed, engines started, normal takeoff and departure followed. Holding pattern utilized while coordination with Forward Air Controller (FAC) for clearance to drop zone was obtained. Approach to drop zone accomplished at high speed low altitude. Approximately four minutes from drop zone heavy ground fire was initially experienced. Ground fire continued over drop zone and escape. Significant damage to the aircraft was encountered resulting in crash landing short of the anticipated emergency airfield (Lai Khe). Due to inflight fire over drop zone load was jettisoned precluding inflight explosion and complete aircraft destruction and loss of crew. Partial supply recovery by friendly forces was accomplished. Aircraft was an eventual complete loss. Crew survived, rescued by 1st Air Cavalry, 9th Division, F Troop Helicopter crews of the United States Army. Loadmasters were carried due to the complexity of the applicable CDS procedure. One of the extra Loadmasters was a Vietnamese Loadmaster in compliance with the Vietnamesation Program. The normal crew compliment on a C-130E is five crewmembers: Aircraft Commander, Co-pilot, Flight Engineer, Navigator, Loadmaster. The following “Audio Tape Transcription” is the verbatim contemporary recording of the audio recording made two days following the incident. The recording was created contemporaneously and was envisioned as a private memorialization of pertinent details of the flight in question. This transcription has not been altered from the original transcription. The audio was recorded 20 April 1972, at my home in Taichung, Taiwan. The audio tape was then mailed to my parents on 23 April 1972, eventually transcribed by Mr David L Evans (deceased 15 April 2010), English Professor, Brigham Young University, my cousin by relation, in the same year. The whereabouts of the original audio tape is not known. I read the transcribed version approximately one month following transcription; no errors of omission nor incorrect wording was noted. Following my initial reading, I did not know the location of the original written version until notified by family following my mother’s (Mary Bee Jensen) passing in 2018. She had included my report as an addendum in a book she authored, “The Flight of the Mary Bee” published in 2017. I’ve reviewed the report as it is written in the adendum and have relied on my memory of 45 years to establish the veracity and content. To my knowledge her recitation is exactly as I remember the original. Where I have added comments, they are enclosed in parentheses. The recitation is in raw form as recorded and transcribed. “The flaps burned off the huge C130 Hercules and blew away from the plane. Large chunks of the wing were burning off and departing into the slipstream. The fire at this time was so hot that the metal was literally dripping then blowing off the wing as it continued to burn. The loadmasters in the cargo compartment were telling us to get the plane on the ground before we lost the right wing. I had zoomed the aircraft, trying to blow the fire out and get enough altitude to bail out. As the two loadmasters tried to open the bailout exits, they found that due to the extensive battle damage we had taken from ground fire, all the exits were jammed. Additionally the fire had extended into the wheel well igniting volatile hydraulic fluid. It rapidly spread throughout the cargo compartment. We were locked in the aircraft with the entire right wing on fire, flames extending the entire length of the fuselage, the flight controls already beginning to freeze up. My mind quickly recapped the events that had happened in a matter of five minutes to bring me into a situation that I had been briefed on but never thought could happen to me. We had been hit badly and were on fire since over An Loc, Republic of South Vietnam. My primary concern at the moment was to get us as far south as possible with the hopes that I could save the plane and the crew. One of our planes going across An Loc the three days previously had taken heavy ground fire; the flight engineer in that plane had been killed. The plane had extensive battle damage, the pilot had been forced to shut down the two engines on the left as he flew it back to Tan Son Nhut. This was the knowledge we had going in for the brief on the 18 April 1972. There were three crews, mine was the crew in the lead aircraft (this is incorrect as I explain later in this report). We were briefed on the importance of delivering our cargo and the tremendous amount of ground fire that could be expected. An Lôc was surrounded by three divisions of North Vietnamese in their attempt in taking the small provincial capital. Only a handful of Vietnamese Marines and American Advisors remained for the defense of the city. The only supplies they would receive during the next several weeks for their defense would be what the C130’s would deliver by air. The enemy fighters had been hitting An Loc almost twenty four hours a day in an attempt to over-run the stubborn defenders. President Nugyen Van Thiêu of South Vietnam had publicly decreed that An Lôc would be held at all costs while the leaders in North Vietnam had publicly announced they would take An Loc at all costs. Our intelligence briefed a small area existed southwest of the drop zone as possibly being safe and stressed that if we got into trouble to get as far south of An Lôc as possible. 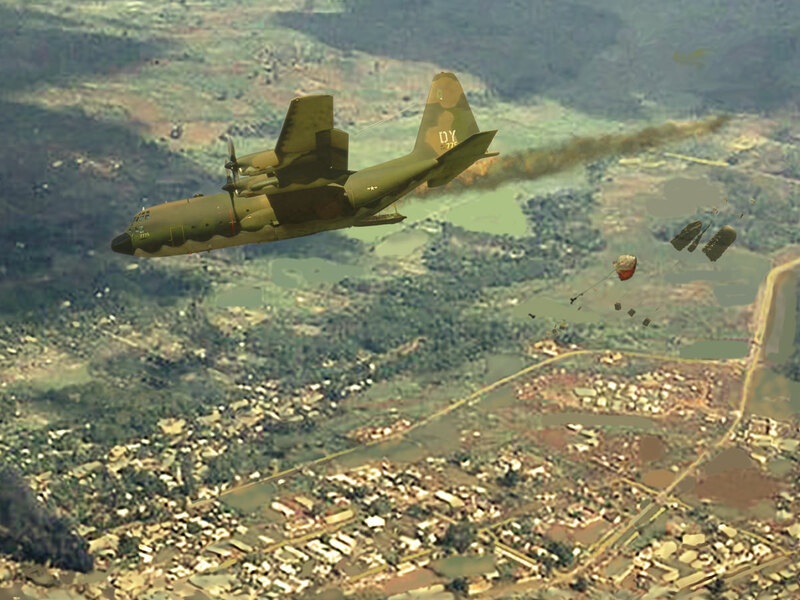 The two previous C130’s that had airdropped over An Lôc had both taken heavy ground fire from all quadrants. I had never actually experienced active combat conditions seeing people shooting at me, so there was a slight amount of intrigue in what the intelligence officer was telling us about what might occur when we flew over the city. We were going to carry thirty thousand pounds of 105 mm ammunition to be airdropped to the defenders of the city. The remainder of this incredible story can be found in the addendum of this book. I was awarded the Silver Star, two Distinguished Flying Crosses (from subsequant missions), and the Purple heart. Don’s flying career was completed in 2003 by piloting the Boeing 777 between Los Angeles and London. (American Airlines)”. AUDIO TAPE TRANSCRIPTION – As quoted from the addendum of “The Flight of the Mary Bee”. Our flaps burned off the huge C130 Hercules and blew away from the plane. Large chunks of the wing were burning off and departing into the slipstream. The fire at this time was so hot that the metal was dripping off the wing as it continued to burn. The loadmasters in the cargo compartment were telling us to get the plane on the ground before we lost the right wing, I had zoomed the aircraft, trying to blow the fire out and get enough altitude to bail out (we reached 6,000 feet before realizing that bailout was futile) . As the two loadmasters tried to open the bailout exits, they found that due to the extensive battle damage we had taken from ground fire, all the exits were jammed. We were actually locked in the aircraft with the entire right wing on fire, flames extending the entire length of the fuselage, and (sic) the flight controls already beginning to freeze up. My mind quickly recapped the events that had happened in a matter of five minutes to bring me into a situation that I had been briefed on but never thought could happen to me. We had been hit badly and were on fire over An Lôc, Republic of (South) Vietnam. My primary concern at the time was to get us as far south as possible with the hopes that I could save the plane and the crew. One of our planes going across An Lôc the previous day had taken heavy ground fire; the flight engineer in that plane had been killed. The plane had been shot up pretty badly and the pilot had been forced to shut down the two inboard (actually the two engines on the left side) engines to bring it back to Tân Són Nhút. April, 1972. There were three crews of us, and mine was the crew in the lead aircraft (some confusion exists here. We were the only crew scheduled on 18 April. Three days prior, three aircraft were scheduled to make drops. One aircraft had mechanical issues and returned to base. The second aircraft encountered heavy resistance, killing the flight engineer before returning to base on two engines. The third aircraft aborted the drop. These three flights were conducted on 15 April 1972. On 16 April two additional drops were made, each aircraft received substantial battle damage. No drops were attempted on 17 April. We were the fifth scheduled airdrop departing 18 April. Subsequent low level drops were attempted resulting in the loss of two C-130’s and their entire crews. Drops eventually were moved to 10,000 feet, well above the intensity of ground fire using a newly developed method of CDS delivery). Our intelligence briefed a small area southwest (actually due south) of the drop zone as possibly being safe and stressed that if we got into trouble to get as far south of An Lôc as possible. The two previous C130’s that had airdropped at An Lôc had both (see explanation above) taken heavy ground fire from all quadrants. I had never actually been in real (sic) combat conditions with people shooting at me, so there was a slight amount of intrigue in what the intelligence officer was telling us about what might occur when we flew over the city. We were carrying thirty thousand pounds of 105 mm (unverified whether 105 mm or small arms) ammunition to be airdropped to the defenders of the city. An Lôc came under heavy attack, so they cancelled our flight on the 16th until things calmed down. My adrenalin had built up to a point where I was almost completely exhausted from the sitting and waiting. The same thing happened the next day (17th). It got to the point where the defenders at An Lôc were virtually in critical need of the ammunition that we had. On the 18th of April, we were told that the ammunition was needed immediately and that our plane would be sent out single ship to make the delivery. We arrived on the morning of the 18th at our operations building and got the preliminary briefing. My original crew had been almost completely replaced with the exception of myself and my flight engineer TSgt Ralph Kent (actually I was the only member of my “original” crew). Major Leigh Pratt, my copilot, had been sent down from CCK, Taiwan, to participate in the airdrops due to his extensive experience in the C130. Major Robert Kirkpatrick had replaced my original navigator who had returned to CCK. My regular loadmaster had gotten sick and was replaced by Sgt (Airman 1st Class) Charles Armistead who is (was) an aerial port loadmaster. Sgt Ralph Bemis was assigned as the extra loadmaster (Sgt Bemis actually served as Lead Loadmaster) as it required two loadmasters for the airdrop that we were going to make. My crewmembers represented a vast amount of flying (sic) experience, and we were going to need it on this particular day. In addition, we had a Vietnamese loadmaster who would also accompany us (who did not speak English). We finished the preliminary briefing and checked out our survival equipment. I sent the enlisted crewmembers (they actually reported directly to the aircraft to do the loading. The flight engineer also proceeded directly to the aircraft accomplishing his preflight checks. (Both he and the Loadmasters thereby missing the operations and intelligence briefings). The rest of us walked over to another building to get the latest intelligence. It hadn’t changed from the previous days, so as we rode the crew-bus out to the plane we knew exactly what we faced. We arrived at the plane, got the loadmasters and engineer together and quickly briefed the flight plan and emergency procedures in case we needed them. As I strapped into my seat, I found that with all my survival gear on, I wouldn’t be able to get out to the seat if I needed to in a hurry. I removed my survival vest and parachute, setting them next to my seat, and wore only my body armor and flak helmet. Major Pratt had put his parachute in the seat but with this exception we all wore as little as possible and situated the rest of our equipment where it could be easily reached. The loadmasters had coiled chains on the floor of the cargo compartment (behind the “Buffer Board”) as added protection to the ground fire that could come up through the bottom of the aircraft. The checklists were quickly completed and we taxied to the runway. We started the aircraft down the runway with a full load, got airborne, and headed for An Lôc, only 42 miles northwest of Saigon. We immediately changed our frequencies over to the Forward Air Controller who worked the An Lôc area in an (Cessna) 0-2 recon bird. He was to make sure that the route was clear, to observe our run-in, and call out the ground fire. We were to have another FAC on our escape route south of the city, which would pick us up as we came off the target and headed for our escape. Major Pratt established radio contact with the FAC as we climbed to six thousand feet to accomplish the necessary pre-drop checklists. The FAC gave us the go-ahead and I banked sharply into a descent for the run-in altitude. Our initial run-in point was 13 miles southeast from An Loc, where we needed to get down to our lowest altitude; right on the tree tops. We flew approximately 25 feet above the tops of the trees. This was the high speed portion for our run-in. It didn’t give the big guns a chance to get on us because we were too low, and of course, it provided quite a bit of protection as far as the NVA seeing us. We were holding 250 knots indicated. We were so low to the ground that to turn the aircraft, I had to actually lift the plane up 30 or 40 feet in the air, make my turn, and then settle down on the trees, all at 250 knots. The terrain was essentially flat with rolling hills and we proceeded towards our target. Major Kirkpatrick was giving me small heading corrections and advising when our pre-drop checks were complete. I remember flying to the top of one small hill. As we reached the ridge, I spotted An Loc slightly off the right of the aircraft’s nose. I took the aircraft over the ridge and down into a rubber plantation with the drop zone confirmed. We called our slow down about this time and then I started to pop the aircraft up to drop altitude, approximately 600 feet above the ground. I pulled the power into flight idle, added back pressure and was in the process of popping up when we felt the first jolts on the aircraft. These were pretty strong jolts from ground fire that was hitting us. My attention was on flying the aircraft with Major Pratt backing me up. In case I took a hit; he would have immediate control of the plane. Major Kirkpatrick and Sgt Kent saw the flashes of the big guns off to our right as they pumped their shells at us. It was about this time that my loadmaster in the back called over the interphone that our right wing was on fire. I initially lost track of the altitude we were going for and the airspeed, and my first thought was to get us out of there. We were on fire and taking the amount of ground fire that we were, we weren’t in a good position to make an accurate drop. Thirty thousand pounds of ammunition had to be jettisoned in a hurry. I spotted the drop zone right off our nose and held the wings level while the loadmasters jettisoned our cargo. As soon as I felt the ammunition depart the aircraft, I shoved all throttles hard to maximum power and banked sharply to the south. The load had exited the aircraft beautifully and due to the wings’ level position of the aircraft at the time of the jettison, landed in the drop zone. The friendlies at An Loc had gotten their ammunition. As I was in my sharp turn to the south, the fire had gotten worse and they really opened up on us from the ground. We later found out that “Charlie” had 23mm, 37mm, mortars, B-40 Rockets, 51 calibers, AK-47, and just about any other type of small arms firing at us as we made our drop and escape. The cargo compartment was taking a tremendous amount of punishment from the ground fire. The two loadmasters were shouting over the interphone to get us out of there. Sgt (Airman) Armistead and the Vietnamese loadmaster both were hit (wounded) by the firing. It was hell in the cargo compartment; the two loadmasters later stated that the entire aft end of the plane was filled with sparks as the ground fire came up through the bottom of the aircraft. Amazingly, the cockpit area didn’t take a round (that we were aware of….). As I rolled out on a southerly heading, I found that it required half of my aileron deflection to keep the wings level. This was my first indication that something was really wrong with the control system. The loadmaster told us that our number three engine was on fire. A quick check of the engine instruments confirmed this as we were rapidly losing normal instrument readings. The engine was still putting out good power, so I elected to leave it running as long as possible (this caused some consternation between Pratt and myself. He wanted to perform a shut down, I didn’t. I needed all the power I could get and even with the engine on fire it was producing power. We delayed the shutdown). All four engines were at maximum power as we rapidly gained airspeed. I felt that we just might be able to blow the fire out if we could get the aircraft moving fast enough. We discussed bailing out if the conditions got any worse and directed the loadmasters to get ready. I zoomed the aircraft for (bail out) altitude. The fire was now so hot that the metal was dripping off as the wing continued to burn. The fire was located at the right wing root and was being fed by raw fuel streaming from several large holes in the wing. It had already spread to the number three engine completely engulfing it in flames. The flaps on the right side blew off the plane as the fire became more intense. It was definitely not going to be blown out. I got the plane to three thousand feet and slowed it to a point where we could open the ramp and door for bailout. They wouldn’t open. We had the loadmasters attempt to open the paratroop door on the left side of the aircraft but it had taken so many hits that it was jammed. The paratroop door on the right side couldn’t be opened due to the intense heat and flames from the wing fire. We discussed where we could land the plane. There is small airfield by the name Lai Khe about 20 miles south of An Loc, and we had been briefed that this would be an emergency airfield if we needed it. Major Kirkpatrick gave us an initial heading and we started for Lai Khe. The controls on the aircraft at this time were starting to go, and the plane began a slow roll to the right that I was unable to control with normal control pressures. I put in full left aileron to counteract the roll and was able to initially get it back to a wings level position. Our number three engine lost all indications and we feathered it immediately before it seized on the rapidly weakening wing. The plane again started a slow roll to the right as I was holding in full left aileron. I pulled the number one engine towards flight idle attempting to use asymmetrical power along with adding left rudder in an attempt to bring the wings back level. This method proved successful; however it was costing us altitude and airspeed. As the situation got worse, I had to retard both number one and number two engines towards flight idle with as much left rudder as I could get to bring the aircraft back to wings level as it continued to roll off to the right. As I pulled the power, I had to descend to keep airspeed. As the wings came level, I would add power to catch the airspeed and slow the descent. This continuous method of control caused us to be in an almost constant descent to prevent the aircraft from uncontrollably rolling off to the right and into the ground. Our interphones had been shot up so badly that by now I had lost mine completely. My engineer and one of the loadmasters were in the same position. So here we were, headed south, trying to find Lai Khe with half the plane unable to talk to the other half. I had spotted several areas where I possibly could have put the plane down. The area we were going through was straight jungle with the trees going up about 150 feet, very thick but the Vietnamese long past had cut areas through the jungle here and there and had cultivated it. These areas had long since been abandoned and were now just elephant grass and marsh area, very narrow strips. We were actually locked in the aircraft with the entire right wing on fire, flames extending the entire length of the fuselage, and the flight controls already beginning to freeze up. My mind quickly recapped the events that had happened in a matter of five minutes to bring me into a situation that I had been briefed on but never thought could happen to me. We had been hit badly and were on fire over An Lôc, Republic of (South) Vietnam. My primary concern at the time was to get us as far south as possible with the hopes that I could save the plane and the crew. We were now getting quite low on altitude and the fire was completely out of control on the wing (we had now lost all hydraulics, electrical, and pneumatics). I later learned that the FAC who was supposed to watch our exit was able to follow us mainly by the fire which extended down from the wing, past the fuselage, over the tail, and out beyond the back of the plane. He was amazed that the C130 could take as much punishment as we had and still keep flying. He commented afterwards that we looked like an “Atlas Rocket” headed South (I’ve yet to attribute this comment to a particular individual, but do not challenge his veracity). My co-pilot was able to talk to the navigator, and the loadmaster was still giving him damage reports as he watched the wing through the cargo compartment window. It was difficult (impossible) to see the damaged portion of the wing from the cockpit. Major Pratt was now assisting me on the controls as we had lost all utility and booster hydraulic pressures and were manually flying the aircraft. He was quite a busy co-pilot having to handle the radios, turning switches and knobs as more and more systems on the aircraft failed, and now, having to assist me on the controls as they were well on the way to complete failure. The engineer, Sgt. Kent, backed up the co-pilot in all his actions as well as handling all the red wing lights on his own panel. The right main landing gear well and oxygen bottle exploded into the aircraft and the wing fire immediately broke through the wing root setting the aft end of the cargo compartment on fire. The loadmaster still with the headset told us to get the plane immediately on the ground; we were losing the right wing. The fire had now spread outboard from the number three engine and had engulfed the number four engine. I had already decided that we were going to have to go down because the plane just wasn’t going to fly any longer. The plane was now violently rolling over to the right. It gave me a feeling of complete frustration, as though I were walking a tightrope with one of the big bars for balance. I was holding it on one end and had all that ballast on the other. I just couldn’t control it. All control boost was gone and in an aircraft this big – you just don’t fly it manually. I saw two areas that we could go in, one angled off to our right which would have been the easiest way to go because at that particular time we were in a right bank. On the other side, angling slightly off to the left was another area. I felt that if I could get over to the area on my left, my alignment would be better. If I continued further right, I might not be able to get the wings level for the impact. I saw that we were going in. I looked at Major Pratt. He was motioning with his hand to go down. He had just gotten the word from the loadmaster about the explosion and the fire breaking through the wing root. We were going in anyway, so I yanked the number one and number two engines to flight idle and reared back with my left foot and hit the left rudder with as much force as I could. It was the first time I had opened my mouth since losing my interphone, and believe me I must have cursed every bolt in that aircraft to come out of that right bank. I was able to pull the nose up slightly and the plane shuddered as it came through (too) level flight (Wings level) and (approached) into about 15 degrees of left bank. This was the first time since we had left An Lôc that I was able to get into a left bank. It was through sheer determination on that rudder and power that made the plane respond. The plane shuddered again and then stayed in the left bank. I pushed the nose down and more or less dove it for the ground because the airspeed was so low that we were about ready to stall out. I wanted as much control as I could get before we hit the ground. We had a good lineup on the touchdown area and were approaching it in the left bank. I can still remember seeing the jungle on either side of us as we came down. We were extremely fortunate to have gotten this relatively clear stretch because if we had gone down into the trees, it would have been all over. Just prior to the impact, while still in the left bank, I hauled back on the yoke as hard as I could, shallowed the plane out in the descent, relaxed the pressure on the rudder and was able to time the roll to touch down wings level. We impacted in an extremely nosehigh attitude. Maj. Pratt had put the landing gear handle down just prior to us going in. What little extension we did have, I’m sure, absorbed quite a bit of the initial impact. Shortly thereafter, the gear sheared off and it did become rather violent as we plowed through the marsh. the marsh. It was a violent ride, but at least the plane was going straight. I felt that we were going to make it then. We started picking up some large bushes. They may have been trees, I’m not sure; we were going so fast it was difficult to tell trees from bushes. I do remember the end of the clearing coming up fast with the jungle trees closing in on us from both sides. One rather large bush (tree?) came by, sliding by me just at the left of the cockpit. It was about this time that the plane started to swing around to the left. This was perhaps the most violent portion of the whole crash landing. I had my shoulder harness locked, yet the force of the swing threw me out over the throttle quadrant to the right of my seat. I was still holding onto the control column as the nose of the aircraft dug into the marsh throwing debris up over the aircraft. The cockpit completely blacked out. The plane slid through approximately 180 degrees, the nose came back up and I could see outside the plane again. It came to an abrupt halt. During the last few moments before the aircraft came to a stop, I had a firm idea of what I was going to do. When the plane did stop, there was absolutely no question. I unstrapped my armor vest, threw my helmet off, undid my lap belt, reached up and pulled the pin out of my swing window. I looked out the open window and could see that the entire area around the aircraft was on fire. I felt the plane was going to blow up at any moment. I stuck my head out the window and saw a small patch of ground that wasn’t on fire and dove through the swing window headfirst. I caught my leg slightly and twisted around so I could look up at the cockpit but then I broke loose and fell on down to the ground and landed across my shoulders. I quickly looked at the plane, which was completely on fire. My immediate thought was to get out of there before it blew up. I moved as quickly as I could through the marsh and elephant grass forward and away from the nose of the burning plane. I saw off to my left, about 10 feet away, the Vietnamese loadmaster that we had carried on the plane (he was apparently thrown free. The last position he remembered was climbing the ladder to the cockpit. This is where he was on impact). He was bleeding pretty badly and was motioning to me that he couldn’t move any further. I believe he may have been thrown from the plane before it came to a stop. I went over to him, picked him up and carried him with me. Sgt. Kent was about 10 feet in front of me; he had gone out through the top hatch of the plane and over the side, so he fell even further than I did, but he didn’t appear to be injured. Kent came over to help me with the injured loadmaster. He was anxious to get to the tree line to conceal ourselves. We were only about 20 feet from the aircraft. The Vietnamese loadmaster had his parachute on and it had partially deployed making it difficult for me to carry him. I laid him on the ground and told Kent to help me remove the parachute. It was so tangled up and caked with mud that we finally had to cut it off of him. I picked him up and we again started for the tree line. We then heard the most beautiful sound in the world, helicopters. Two Huey Cobras flew overhead and circled us. They had seen us fly by on fire and could see that we were in trouble, so they immediately got on our tail and followed. They weren’t able to keep up with us and had just arrived as we heard them. They did see the aircraft crash and break up. Their first thought was that there was absolutely nobody alive. The Cobra pilots said that the plane was completely broken up and on fire. As the first Cobra made his pass over the plane, he picked up ground fire from the tree line. I took Kent’s survival radio and tried to establish radio contact with the helicopters. It was about this time that the NVA started moving in on us. What a coincidence; we happened to crash right in the middle of what the North Vietnamese were using as a build-up area from which to over-run Lai Khê, the base we had headed for. “Charlie” was in the entire area and was coming after us. I was later told they were about 100 yards away when the two Cobras flew over and started taking ground fire. It was a beautiful sight to watch those pilots completely suppress the area with their fire power — rockets, cannon, everything — right around us. “Charlie” was so close that if those Cobra boys hadn’t showed up when they did, I would probably have been marching up the jungle chained to the rest of my crew. I then saw two Huey Slicks coming in from the North. I was able to contact them on the survival radio and directed them over to us. The pilot of the first Slick flew in and landed not more than 10 feet from where we were. The crew of the Slick asked me how many crew members there were still in the plane. I told them there were still four in the aircraft and the pilot radioed the second Slick with this information. The second Slick flew towards the burning wreckage and landed not more than a few feet from it. The gunners got out of the helicopter and went into the burning wreckage and helped the rest of my crew get out. When we were all safely aboard the two Slicks, they took off to the north, both of us taking ground fire. The two Cobras flew our wing as we departed the area. As we left, the two Cobras expended their entire ordinance as “Charlie” was determined that none of us were going to leave. We used all the first aid kits they had on board the Slick that I was on to treat the wounds of my crew members. The choppers landed at an outpost and we switched to another helicopter. I later found out that our original chopper crew had landed with approximately five gallons of fuel on board. They had extended their efforts to the maximum in their rescue effort. We flew on the second helicopter into Tán Són Nhút and landed near the hospital with two ambulances waiting for us. The second helicopter landed right after us with the rest of my crew. It was amoving scene as we were all united for the first time since the crash. Major Pratt came off the helicopter and I can still remember he, my engineer and myself standing there grinning from ear to ear, with our arms around each other, patting each other on the back so grateful to be alive. The loadmasters were treated and were in satisfactory condition the following day. Major Pratt, Major Kirkpatrick, (T)Sgt. Kent, and myself celebrated our good fortune at the Officer’s club that night. Colonel Iouse sent me to Taiwan on 20 April for recuperation. I spent several days wrestling over my desire to contine flying. Technical Sergeant Kent eventually elected to quit. I consider him a casualty of the war. He is a good man who survived an experience none of us should have survived. After a week I was ready to return. I was given my personal C-130 for a week to do with as I please. Once again I was on top of the world enjoying flight with my regular crew. I shall always remember the caring nature extended to me by my Squadron Commander, Lt. Colonel Philip J Riede, and Wing Commander, Colonel Andrew P Iosue (he eventually became a Four Star General). Upon completion of my week getting my feet wet again, I was back in the thick of combat. My first mission was a low level air drop over An Lôc (A repeat of 18 April). It was gratifying to fly this mission with my regular crew. Adding to the challenge, this mission was flown at night. Heavy resistance was encountered but surprisingly little damage was found on our aircraft following the return to base. Our load was completely recovered and put to good use. Once again we had provided critical ammunition to the defenders. I received the Distinguished Flying Cross for this mission. My crew and I flew many subsequent airdrop missions over An Lôc using the High Altitude Low Opening (HALO) CDS technique specifically developed for the An Lôc operation. These operations continued through the of June of that year. Two of the HALO missions are worthy of comment. The first occurred during our inbound approach to the An Lôc drop zone. We received an announcement on Guard Frequency of an inbound Arch-Light strike (B-52 bomb strike) that conflicted with our mission. We were successful in turning back the strike and instead, delivered criticaly needed ammunition. A subsequent mission involved an NBC news crew that flew on my aircraft on an An Lôc HALO mission. They recorded the cockpit and cargo compartment activities throughout the mission. Following the mission, I provided an indepth interview sescribing what we had just done. This news segment was preempted from broadcast due to news coverage of President Richard Nixon’s visit to China. I was awarded the Silver Star and Purple Heart for the 18 April mission. The 374th Tactical Airlift Wing subsequently submitted my name for the 1972 McKay Trophy. An unexpected recognition that I will always treasure. To be recognized by ones peers is an honor seldom equaled. Audio tape recording by Captain Don B Jensen 1972. “Flight of the Mary Bee” (Publisher – Creo Books) author: Mary Bee Jensen. General Andrew P Losue, United States Air Force (Retired). Lt Col Robert Frank, United States Army (Retired).